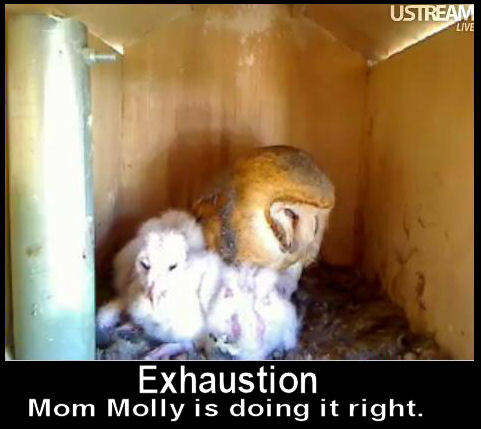 Molly is a wild barn owl who laid a clutch of eggs in an owl box located in San Marcos, California. She is about 14 inches tall, with a wingspan of about 43 inches. She weighs about one pound. Molly is about one year old. Barn owls eat mostly rabbits and rodents (mice, rats, squirrels, gophers). Sometimes they eat reptiles and other birds, depending on what is available. Can she choke when swallowing something large? Owls can eat and breathe at the same time, which is how they swallow large animals without choking. She can do this because she has a breathing tube in her tongue. Is Molly a pet? Is she held in captivity? Molly is a wild animal who is free. She chose this box as the place for her nest. Why does it seem like Molly is always sleeping? Barn Owls are nocturnal. They sleep most during the day and are more active at night. How long will she stay in the box? Molly will stay in this box until her young are old enough to fly. Where does she go when she leaves? Although Molly doesn’t leave very often, when she’s sitting on her eggs, she goes out a few times per night to defecate and stretch her wings. Why does Molly sometimes pant and hold her wings open? Because her nest is in a warm part of the country that gets lots of sun, the owl box has the potential to heat up. Opening and closing her beak is called “gular fluttering” which helps her stay cool. Lifting her wings away from her body is like taking off a sweater. Where does she get water? She gets water from the food she eats, which is mostly fresh meat. How often will Molly lay eggs? The shape of her face is unusual. Is there a purpose for the heart-shape? Barn Owls have very distinct, heart-shaped faces with small dark eyes, an elongated beak, no ear tufts, and longer legs. The position of the facial feathers helps direct sound toward her ears with such accuracy that she can hunt in complete darkness. Is that a scar on Molly’s forehead? No, Molly has the usual markings common to Barn Owls. The dark, vertical line sometimes visible between her eyes is an area where the feathers meet. Both Molly and McGee’s multi-colored feathers are a kind of “desert camo”. The gold and gray patterns make them practically invisible during the day when perched in a tree. Can I have one of the feathers? No, it is illegal to possess feathers from raptors and other birds, including owls, under the Migratory Bird Act. While this might seem silly, this law protect birds and prevents people from shooting them for their feathers. When she scratches her head, can she cut herself with her talons? Barn owls have a serrated comb on the middle claw. So far, scientists believe this to be a grooming adaptation that prevents them from hurting themselves. After she digests food, she coughs up an odorless “pellet” that is made up of bones, feathers, and fur. You can tell she is going to produce a pellet because she looks like she is gagging for a few seconds. She must regurgitate a pellet before she eats anything new because the pellet partially blocks their digestive system. Many science classes dissect these to learn what owls eat. Curious to see how pellets arrive? Molly shows us here. Is a pellet the same thing as poop? Nope. A pellet is non-digestible food like bones and fur which comes up her throat and out her mouth. When Molly goes out at night, she’s usually going to defecate or “poop”, which comes out the back end. Learn about the Molly’s mate, McGee! I just viewed the owl pictures today. They were great! I was watching the owl box last night and saw flashes, now I know pictures were being taken. I am going to let all my friends that did have time to watch the owl box…know about this website to view the pictures. Thank you for all your dedication, hard work, and sacrifice in bringing Molly and McGee’s family into our home, making them our family!!! THANK YOU SO MUCH FOR SHARING THEM. Looking at the size of the owls, it won’t be long before you get to take that vacation you have been looking forward to!!!! I have a small little book for kids entitled “Owl Babies” written by Martin Waddell illustrated by Patrick Benson printed by Candewick Press. It is a sturdy book board making it indestructible for little ones. This cute story is about 3 baby owls living in a hole in the trunk of a tree waiting for their mama to come back to feed them. Maybe later if you have a hard book made you might like to view this book for ideas? A small book would be great for little kids and a bigger book with more detailed story for old kids/adults! p.s. If you are interested in seeing this book and cannot find one….I will loan mine to you. Just let me know. erected soon…it’s been in the garage much too long. Molly is a nice barn owl :). You cannot click on the Molly mug to buy it. So where do I go from here? Thanks for a reply to my email address. Those spicy crackers sound great! Can you send/post the lady’s website? I’d like to order some, too. Are you really going to leave on Monday if there are still owlets in the box? Sure hope not! Thank you for opening up your home & owl box to the whole world! It’s been a great thing to see. Take care, Cathy Burrus, Long Beach – CA. Words are totally insufficient to express our gratitude for all you have done to share this great experience of Molly, McGee and their family. We have not only grown to love these barn owls, but you Carlos and Donna too. We will be forever grateful for your expanding your technological wisdom Carlos and bringing us more than we could have ever asked for. Thank you Austin too for the many hours you have devoted to this project. Eric, John and Chris have had amazing input. I am sure that the “empty box” this morning will be met with mixed feelings! I am sure that all of their careers will be enriched by this experience. I will truly miss sharing your morning tea, Carlos and the fun informative chats throughout the cay. Thank you so very, very much Carlos and Donna. I hope you have a wonderful, safe vacation. You have definitely earned it. Loved the last few months watching Molly-hope there will be more. let us enjoy, with you and your family, the lives of Molly and McGee. you having to do it. Molly and McGee never really left they came back every night. It is Molly and McGee. I’m curious how you know this is Molly and Mcgee again. Couldn’t it be a different pair of owls. Thanks. I have the eBook, Molly mug, Molly, McGee and kids mug and the Dubley tote bag. Really like everything! Austin, thank you for the DVD and the many hours you spent doing it. The quality is superb and enjoyable. Got John Atkinson’s cartoons as well. They are a riot! My maiden name is Atkinson and my Daddy’s first name was John. What a coincidence! Look forward to receiving the signed hardback Molly book later on. Carlos, Donna, Austin, Eric, Chris and John, thank you for all you have done to bring this work of nature to us. What a wonderful world we live in and thank you for sharing your love. Molly and McGee, we love you! Do you folks have a live 24/7 cam one can look at? If so, I can’t seem to find it. Thank you Donna and Carlos for all that you and family have done to make this possible! I am so happy to be a part of something like this! I work at United Cerebral Palsy. My crew has been watching Molly and Family since February. Every morning they come in and check at my desk for updates. They were all saddened when the first owlet passed now I have to tell them about Jody. Is there any way that someone could donate the Molly DVD to us. It would be a great suprise for the handicapped adults that I work with. Please email me at readystampsgoddess@yahoo.com. We have 19 adults that make rubber stamps mostly for the government. AARONBROTHERS ART & FRAMING IS HAVING A CONTEST FOR YOUNG PEOPLE AGE 8 TO 12 It’s called Legend of the Guardians the Owls of GA’HOOLE. Create your own Owl character for a chance to win an owl’s eye-view trip to Sydney, Australia! Here is the email on the contest or call your local aaronbrothers. The bobble their heads because they can not move their eyes. They are fixed where our are movable. 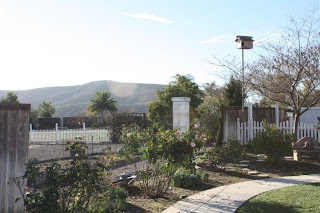 Can you hear the owlets calling for food from your yard? They sound so loud in the box I would think they would attract unwanted guest. Great story it is without doubt. We’ve been looking for this tips. I also like the design was this a free theme or a pay one? I am watching Molly sleep and see that only her right leg appears. Is she sleeping with a leg up, or has she been injured? What is a good resource that describes the breathing tube in the barn owl’s tongue. I teach environmental science and would like to pass this on to my students. Please tell me why my twelve days old owlets of Long eared owl wont regurgitate pellets each day? I feed them with mice and rabbit finely chopped. They ask for food but dont regurgitate whereas their excrements are absolutely normal. When pressed gently their stomach seems empty. Does that mean that they have swallowed the whole food and no pellet is formed? Is it safe to feed them? As more than 14 hours have passed since the last feed. Its an emergency. Please reply as soon as possible. The owlets were orphaned. Your best bet is to keep feeding them and contact a local wildlife rescue center. They will know what to do and how to care for the owls.